Here at Smoke in Chimneys farm we have chosen Icelandic Chickens as our laying hens. 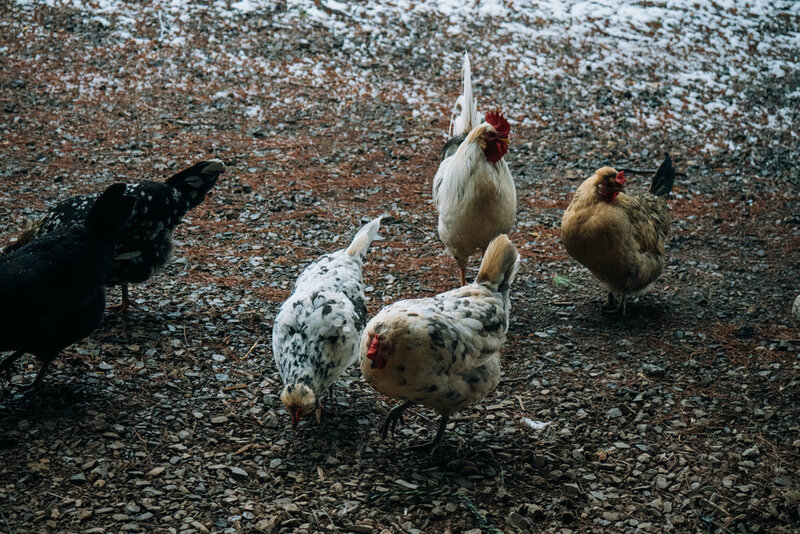 These chickens are not only a heritage breed, but considered a race of chicken, as their gene pool is still exceptionally diverse. Additionally, they are avid foragers and survivors; they are impossible to catch and often fly 30 feet into trees. What we love most about our Icelandic Chickens is the orange yolk of their eggs. Our Icelandic Chickens are given full access to the farm with zero boundaries 3/4 of the year and we don’t feed them anything. They graze the woods and garden central to the farm during the fall, winter, and spring . During the summer they are kept in a run along the garden, to keep the peace, or are rotated with the cows to make use of their scratching skills to spread manure. They home in a mobile chicken trailer at night and always have access to their nest boxes filled with plush straw. They are supplemented with a local feed mixture in the evenings only 1/4 of the year, during the winter, but throughout the days they graze bugs, grasses, rocks, seeds, and are treated with vegetable scraps. Why Smoke in Chimneys Eggs? Unlike conventional eggs, from chickens that are kept confined inside, given a diet entirely of grain, and often given antibiotics, our eggs are not only void of any chemicals or medicines, but are rich with flavor and nutrition from the diverse foods that our chickens eat. They are packed with protein and although somewhat smaller than a conventional egg, they are known to be more filling. Their yolk is a bright orange as an indication of the dense vitamins and minerals they are filled with, all received from the varieties of grasses, bugs, and of course, the sun.